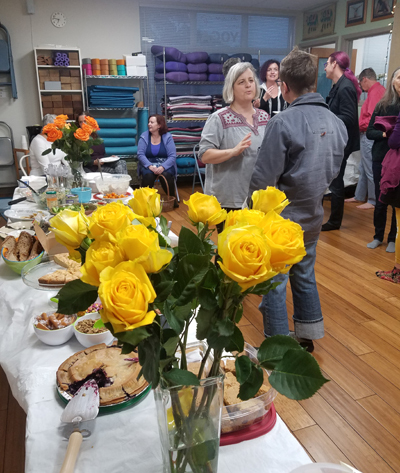 Tree House Iyengar Yoga hosts special events at the studio that bring our students, teachers, and their families and friends together off the yoga mat. Our events range from potluck dinners, to classes on yoga philosophy, and fundraisers for various charities or scholarships. We have a vibrant and diverse community with a shared interest in living a meaningful life. You are welcome to join us at our public events. We also host many special topic workshops that guide the experienced yoga student to a deeper understanding of the effects of asana practice and sequencing. Our teachers also have specific expertise they enjoy sharing with the community. Our upcoming workshops are listed below. We ask that you register at least two days before the workshop to ensure there are spaces. If you have questions about availability of a workshop, you can email info@thiyoga.com, call the studio, or email the workshop teacher’s email listed on their bio page. Joanna, one of our newer teachers at Tree House, recently traveled to the Iyengar Institute in Pune, India. She learned some exciting new techniques to share with you. This workshop will focus primarily on twists and chest openings inspired by Pune classes. Join Angela for restorative poses to open up to the new season and to awaken your body. This workshop will include poses to improve digestion, reduce sluggishness, and increase circulation when you travel. Join Barbara and Fred for a time to enjoy the active summer energies, find balance, and focus your internal heart energy.